Ol' Myrt here has gone to a genealogy event each of the last three days, and so I haven't been doing a lot of blogging. One must spend time learning new tricks of the trade. The DAR Genealogical Research System was the subject of Jennifer's talk, presented at the Fairfax Genealogical Society at their November general membership meeting this past Thursday evening. She gave the same presentation at the Atlanta Family History Expo and garnered rave reviews. Jennifer is in a good position to discuss the holdings of the DAR Library since she worked in the DAD Genealogy Department approving applications for 2.5 years. She did make the point that the DAR's Genealogy Department is completely separate from the DAR Library, and employees typically don't switch departments. DAR is the abbreviation for the lineage society known as the Daughters of the American Revolution. Jennifer pointed out that while you may not have a patriot ancestor, some of the generations in between you and that patriot may be common to another researcher. Men and women alike can benefit from such information, though they may not wish to join the SAR (Sons of the American Revolution) or the DAR. The DAR Library is located at 1776 D Street, Washington, DC. 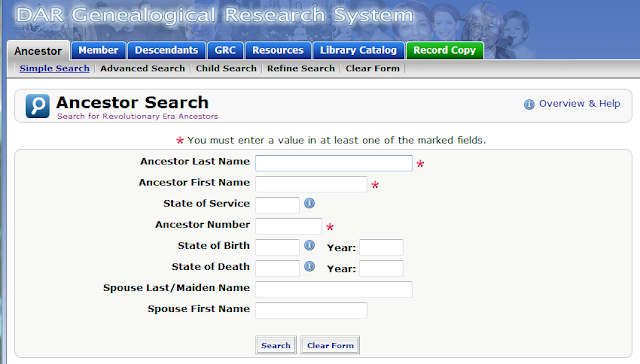 The DAR has scanned and indexed all approved lineage applications (and supplementals), making them searchable online. For a $10 fee, researchers may order online copies of the applications through the DAR website, where the file will appear as a .PDF immediately after processing the fee. The file can then be saved on the researcher's computer. The fee is $15 if you request the copy to arrive via mail or fax. If the application is recent, the page on living individuals is removed and replaced by a cover sheet to facilitate source citation. The DAR has also scanned most of the supporting documents, associating them with the patriot ancestor. Unlike the DAR applications, to view digitized supporting documents, you must either visit the DAR Seimes Technology Center in another set of rooms in the DAR building or use the online DAR Library Search Service to request a copy via fax or mail. My friend Jennifer explained earlier DAR applications did not require substantive documentary evidence to support a lineage. Hence, as my friend Barb Schulz will caution, you've got to take the pre-1900ish applications with a grain of salt. Parts of an approved application may be correct, while other parts may have been disallowed by the DAR Genealogy Department. This search screen is to look for one who served in the military or provided patriotic service during the Revolutionary War. This is for locating those in the intervening generations who may or may not have the same surname. I've dovetailed on a GIST Rev War ancestor through my maternal 2nd great-grandfather Lorenzo J. FROMAN in this manner. 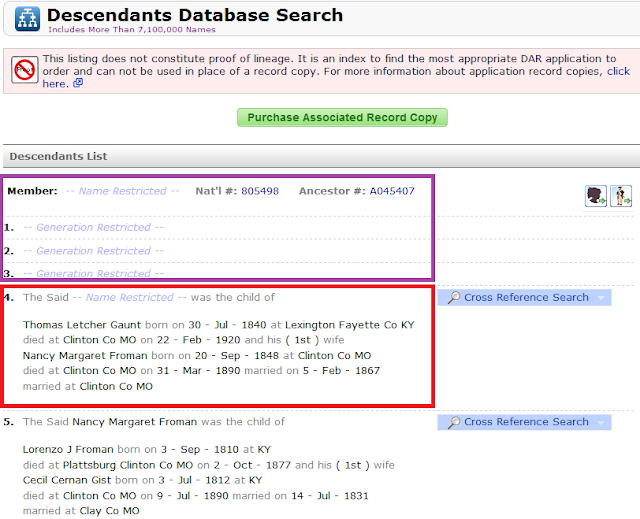 I previously knew that Paul FROMAN and his son Jacob were Rev War, but had forgotten to consider that Lorenzo's wife Cecil Cernan GIST may also have Rev War ancestors. Below, note that the left column is for the descendant, the middle column is for the spouse, and the right column is the patriot ancestor. 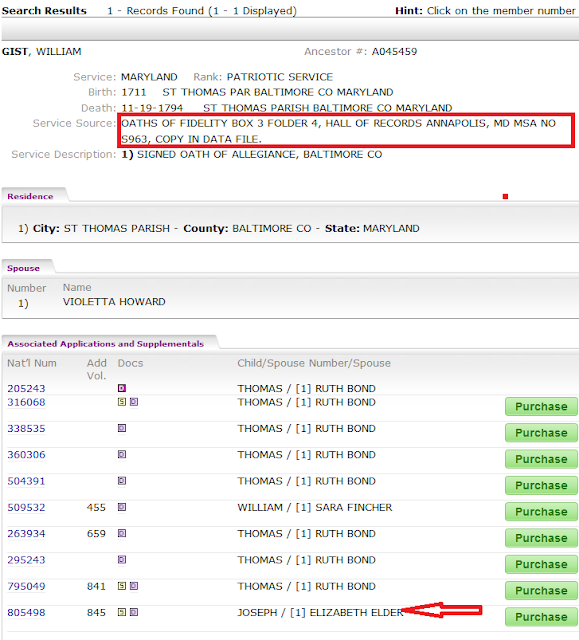 Outlined in the red box below are the GIST & FROMAN patriot ancestors where I'll focus my research. If I had no interest in joining the DAR, I'd still wish to view all lineage applications approved for the FROMANS and GISTS, as source documents may be cited, and additional locations of events such as births, marriages and deaths may show up. DAR application research is designed to fill in gaps in my personal research, by providing clues for locating documents that may support my lineage. A quick view of this Descendants List (below) shows that the information on the first three generations is restricted, outlined by me in purple. The individual in generation 3 is the child of Thomas Letcher GAUNT and Nancy Margaret FROMAN (outlined in red, below.) I know Nancy is the sister of my William Gist FROMAN, so even though I don't dovetail with this DAR application lineage until the 5th generation, I may be interested in obtaining a copy of the application, and then visiting the DAR Seimes Technology Center in person to obtain copies of all source documentation. When I clicked on the "more" above I was asked for my DAR National #, and since I am not a member, I couldn't view additional issues. This information may or may not dissuade me from obtaining a copy of this DAR application. Back to the "hit list" in the Descendants Search above, clicking on the patriot ancestor William GIST in the right column comes up with the following useful info. I already know, from Jean Muir Dorsey's book Christopher Gist of Maryland 1679 and Some of His Descendants that William GIST was married to Violetta HOWARD. But I was unaware of William's oaths of fidelity in Box 3 Folder 4 Hall of Records, Annapolis, Maryland. I may elect to order the last application on the list since Joseph GIST and Elizabeth ELDER are familiar names in my family tree. Jennifer explained that supporting documents for some pre-1978 applications aren't scanned, but are available only on fiche, and only in the genealogy department. Patrons of the Library may not go into that section of the DAR building, as the function of the DAR's Genealogy Department is strictly to approve or disapprove lineage applications. Jennifer said it may be possible to inquire at the DAR Library reference desk for copies of supporting documents that are suspected to be on these fiche. However, a specific protocol for this procedure wasn't in evidence. By the way, the DAR is getting hip --- they have a YouTube Channel of the DAR! Wow, that's quite a little hitch to be hidden in a bureaucratic process. It's quite surprising an institution such as the DAR hasn't dealt with this roadblock to researchers more appropriately. The DAR also has an official Facebook page, as well as a group on LinkedIn. They're trying to become more social media savvy! BTW, are you a possible cousin of Honorary President General Linda Gist Calvin? She is a descendant of Capt. Benjamin Gist, NC/TN, #A045394. Myrt, I'm bookmarking this post for further study. Lots of interesting and useful info here, too much to digest in just one quick read through. Thanks for posting it!! !